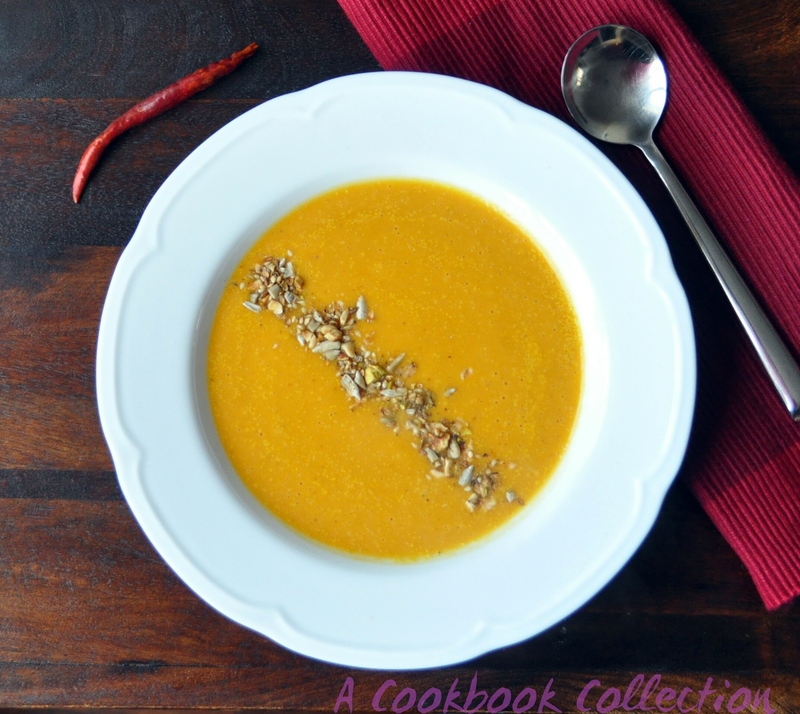 I would never have thought that I’d be posting a recipe for soup in June, but here we are. As there is still a real chill in the air I’m not quite ready to commit to salads at all times just yet. 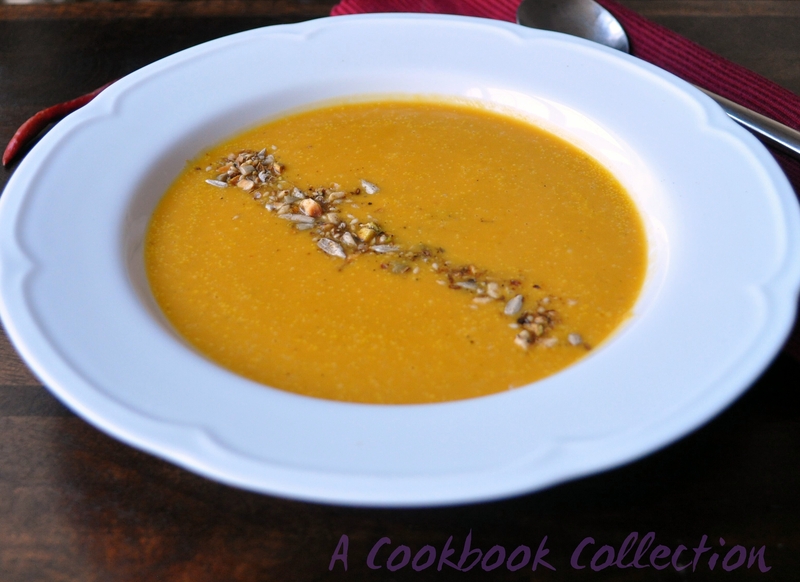 Butternut squash soup is something I make fairly often but never bothered to write up an actual recipe for. It is something I usually just throw together with whatever is available. I was flicking through a new cookbook The Detox Kitchen Bible by Lily Simpson and Rob Hobson and they had a recipe for this soup. I have to talk about this book for a sec – I love it! I have a few healthy eating cookbooks already that I pick through but this is the first one I’ve read where I want to make everything! Rob Hobson is a nutritionist so this book is about eating healthy to make yourself better, not just for weight loss. They describe which recipes to use for for your own particular health needs. I can’t recommend it highly enough. Back to the soup. Butternut squash is one of those ingredients like avocados that I really like but that can be very bland. They need a strong flavour with them to make them sing. Enter chilli! I was a bit intrigued when the recipe described roasting the veg without any oil and for a minute thought it was an error. But of course this is all to keep the soup healthy and as low fat as possible. I was sure it wouldn’t work properly but of course it did. I’ve added garlic and you could add different spices if you’re not fond of chilli. I do think chilli is the best match for it though. Preheat your oven to 180c/160c fan/gas mark 4. Line a baking tray with non stick parchment paper. Peel, de-seed and chop the squash into 2cm chunks. Use a good sharp knife to cut the squash and let the knife do all the work for you. You’ll do yourself an injury if you try to force it! Spread out the diced squash on the parchment paper and season with salt and pepper. Roast in the oven for 20 minutes. While the squash is roasting, peel and finely slice the onion and peel the clove of garlic. Take the squash out of the oven and sprinkle over the onion slices, chilli and add the garlic. Put it back in the oven and roast for another 10-15 minutes. It is ready when you can easily pierce the squash with a knife. Once it has all roasted, pick up the parchment paper and tip all of the ingredients into a blender. Add the stock and blend until smooth. Add the coconut milk and blend again. If you don’t have a blender, put all of the ingredients into a large saucepan and blend with a stick blender. Taste it for seasoning, adjust as needed and serve hot. You could add a swirl of double cream or creme fraiche. I’ve stayed healthy here and just sprinkled over some dukkah for a bit of crunch and extra flavour. *This is another meat free dish but as always, make sure all of your ingredients are suitable for vegetarians if needed.